I used my mobile phone to snap a picture (below) of an advertisement display outside the movie theater. A photographer owns the rights pursuant to Section 102 (5) of the Copyright Act for pictorial, graphic and sculptural works. However my picture is of a another work, a display created by the media company hired to promote the film Jaws. Is my picture infringing? Is my use considered “fair use” protected by Section 107 of the Copyright Act? Is my use for the purposes of comment, criticism or educational purposes? Or is it otherwise transformative in that it supersedes the work copied? Let me know what you think? Read on to find out my opinion and for the Chatham Great White Mile Swim adventure! Back to Jaws, this summer has been filled with news of shark sightings on a nightly basis. Diane Sawyer, Brian Williams, another night, another shark, usually of the Great White variety. Cape Cod seems to be their hangout, and Chatham has been their favorite dining spot. Our vacation site, of course, Chatham, Cape Cod, And I’ve been looking forward to an ocean swim with my daughter who is an accomplished triathlete. Apparently the seal migration to the Cape has attracted this universally feared predator. 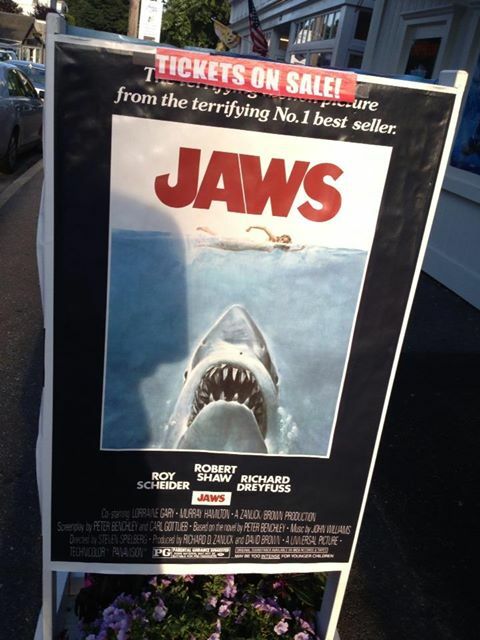 Compounding apprehension was Jaws (picture above) showing for the umpteenth time at the Chatham Orpheum. And of course, it was Shark Week on the Discovery Channel. Arriving at the beach, we saw no one in the water. Lifeguards were waving from the jet ski and I’m thinking “shark sighting” let’s go home. But, Kristen says check with the head lifeguard. Of course, he just smiled and said “go for it!” But, swim parallel to the shore and stay away from seals! Walking the beach, we staked out a half-mile course, mile point to point. Still no other swimmers. Undaunted, we ventured into the calm, 60 degree water, Sometimes you jump in and get “used to it.” Not today, Kristen strapped on her goggles and started stroking, mostly freestyle. On the other hand, I was so cold that backstroke worked best with my stomach and vital organs feeling the warmth of the sun. Switching back and forth between freestyle and backstroke besides fighting the current, it seemed forever to reach the midway point. Along the way, we saw a few giant crabs scurrying across the sandy bottom. The calmness of the water increased visibility, but I still managed to gulp a few swallows as the swell heights increased. Cold, throat sore, thirsty and tired, I was ready to quit. Kristen, though, assured me that the current going back was favorable so we turned and continued. The sun banked behind some clouds and it was much colder. My arms were going numb and my legs felt saddled with 50 lb ankle weights. No longer was the backstroke working. So I switched to the breast stroke, free style combo, which seemed to help. On the shore, my wife kept hearing about those crazy people in the water. Didn’t they know about the Great White spotted not more than 30 feet from the shoreline? At least a few thought we were good swimmers. Though somewhat loco. My wife agreed, hi-tailing it to our vehicle, not wanting to be seen with us. Thankfully we continued and finished in less than half the time of our 1st leg. It made for exciting clam bake conversation that evening. No seals, no sharks, and we were very pleased to have had our first father-daughter swim. My belief is that use of the display constitutes fair use. My use for the purpose of illustration of this story is educational and does not take away or otherwise affect the commercial value of the work. The information provided on this Website and Blog is of a general nature, does not constitute legal advice, and may be considered Attorney advertising.